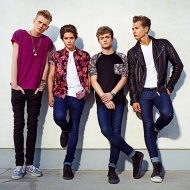 El tema "Million Words" interpretado por The Vamps pertenece a su disco "Wake Up". La letra de la canción "Million Words" fue publicada el 19 de noviembre de 2015 con su vídeo musical. Oh just to be near you, don't you know how good that feels? Did I miss my chance? Is it too late to say? When you were mine, did I push you far away? But then I only had to see you, don't you know how good that feels? Do I get a second chance to make you mine tonight? Escuchar The Vamps Million Words Lyric Video.